Stay updated with the latest in tech, business & the Investopad community - all flavored with memes and a dash of wit. Do any of you Silicon Valley lovers wonder how close the show is to reality? Backchannel did an analysis of all the characters. Here's what they got. No seriously. 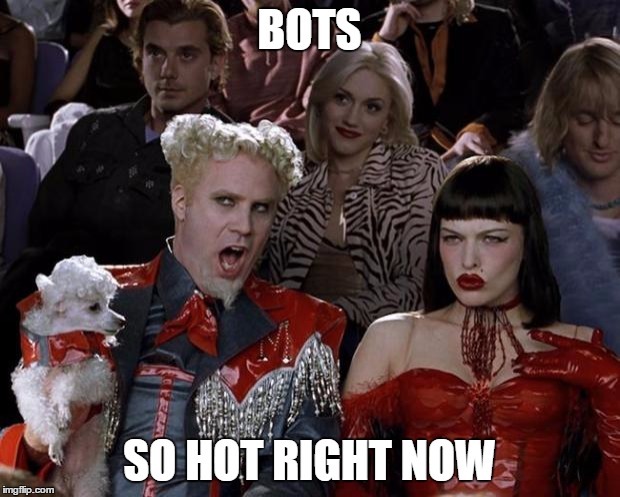 Our Slack has 7 bots at the moment; we're a team of 5. In this educational read, Sarah Guo tries to understand what's causing this bot craze. While we wait for the 2nd part of Sarah's article, Gina Bianchani addresses the same frenzy with a different view. Read why she thinks you should build networks, not bots. Is it theft if there's no such thing as theft? Remember how last month we were really excited about DAO, the distributed autonomous organization that had collected over $150m? Yeah... it got hacked. Well the "hacker" says that he did not infact perform a hack but merely utilized a functionality in the code. The people behind DAO, however, do not agree. This event has given rise to a debate about whether the code was flawed or the description. The words "hack" and "theft" make human, normative presumptions about how you're supposed to use the DAO code. But the code doesn't care. The code can't be "hacked." Let us know what you think on Twitter. "Entrepreneurship is really just a fancy word for delegation. It’s a continuous process of removing yourself from the equation step-by-step and empowering your team to do the things that they do best." Andrew Wilkinson examines his journey as a serial entrepreneur, explaining how laziness drove him to create the best teams and why an entrepreneur must separate themselves from the machinery that is their baby. Buffer is famous for the transparency with which the company is run, to the point that all their salaries are public. They recently had to lay off 10 team members (11% of the team) and they explained to the world why they had to do so. "Steve Jobs went ballistic when public shipping manifests leaked the existence of the iPhone 3G. That’s about the only time something exciting happened in the freight forwarding business." This is one of the few startups that Paul Graham (President, Y Combinator) believes will change the world. Read more. You're a stubborn one aren't you? Lastly, check out Apple's vision of the future in 1987.